As a dietary supplement mix 1 level scoop (14g) of AminoLast with 8-10 fluid oz. of water. AminoLast can be consumed before training, between meals, while training, and post workout to boost your amino acid intake. Citric Acid, Malic Acid, Soy Lecithin, Natural & Artificial Flavors, Sucralose, Acesulfame Potassium, Red Carminic Acid Powder (color). ALLERGEN WARNING: Contains ingredients from milk and soy. Made in a facility that also processes sesame, peanuts, tree nuts, egg, fish/crustaceans/shellfish oils, and wheat products. Believe it or not, the rodent study used to support silk amino acid supplementation used a full spectrum of amino acids including BCAAs. The SAA products don't contain the BCAAs included in the study which is highly misleading. BCAA's are proven to work in numerous human studies. The SAAs touted by a leading competitor are based on nothing more than a comparison against water in rodents and neglected to mention the study included BCAAs on top of it. These days, there are a lot of alternatives to using synthetic colors in supplements. While natural colors are more expensive, we recognize you would prefer natural ingredients and we use them whenever possible. We understand that you would prefer a fully transparent ingredient panel so we'll give it to you. Unlike our competitors who are hiding cheap amino acids like Glycine and Alanine in their blends to increase the total amino acid content, we fully disclose our amino acid content for you. Q. What type of results can I expect from AminoLast? A: Yes. AminoLast can complement virtually any product, whether you are using a thermogenic or a performance product. You can even mix it in with your Myofusion Probiotic Series for a fruit flavored, high protein shake. There are literally hundreds of combinations when using this with other Gaspari Nutrition products such as Anavite, Vasotropin, Anatropin, etc. A: As always, read the label carefully and follow the directions. As a dietary supplement mix 1 level scoop (14g) of AminoLast with 8-10 oz. of water. 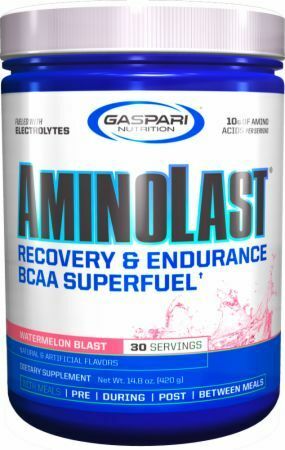 AminoLast can be consumed before training, between meals, while training, and post workout to boost your amino acid intake. It's up to you to find out what works best so give it try and find the best way to FUEL YOURSELF. Gaspari TV presents 155 Reasons, Frankie Edgar's Return to the Cage Full Trailer, powered by Gaspari AminoLast. Follow the Gaspari Nutrition fighter and former UFC Lightweight Champion throughout his training camp in NJ and NY as he prepares for his upcoming rematch to regain the title on August 11th, 2012 at UFC 150 in Denver. Follow the entire series on Gaspari TV.